Daltzi has captured the top shareholder spot with his daring purchase of an additional 5,000 shares. Daltzi earned a Quintuple Supreme Protector's Tip of the Hat™ by sending us past the 86, 87, 88, 89, and 90 billion marks. In total, Daltzi has 13,000 shares--even more than Erotica 1. As I was updating the shareholder info, I was contacted by Erotica 1, who had some assets she needed to offload. Judging by the bounty office, she had been busy of late. 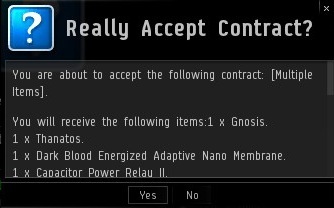 Satisfied customers of her isk doubling business are encouraged to "tip" by adding to her bounty, currently the sixth-largest individual bounty in EVE. The assets Erotica 1 wanted to donate to the New Order were acquired during a game she set up--a game that ended in great sadness for the participants. 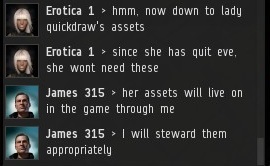 Lady Quickdraw, one of the players, reportedly quit EVE after the game ended. Other players were also disappointed with the result. Erotica 1 told me that if it weren't for a drunk player's mistake, the game's participants could have won big. Suddenly I received a private contract from Erotica 1. Since it did not require me to pay or offer anything, I accepted it. My first carrier, a Thanatos! I trained Gallente carrier skills years ago, but had never found occasion to use them. Erotica continued to give me contracts with me large volumes of ships and equipment, one after the other. Judging by the items and ships included, they seemed to formerly belong to miners and mission-runners. During the ill-fated game, participants had been contracting Erotica 1 all or a large portion of their assets. Erotica 1 repeatedly apologized for the large number of contracts we had to get through. Lady Quickdraw, in particular, had been heavily invested in the game. The scroll bar for her contract went down for many pages. Though the game didn't result in the players winning any money, there were no losers. 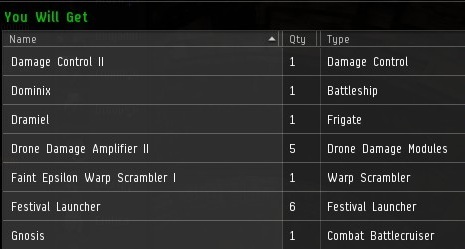 The entire highsec community always hits the jackpot when they give generously to the New Order. 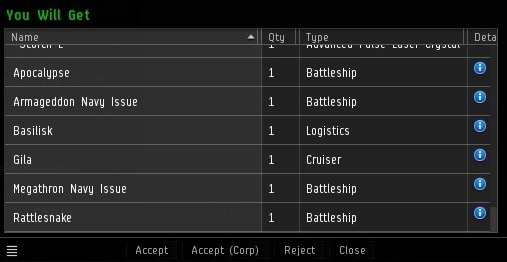 may these generous donations help spread the glory of the order to the last edges of highsec and beyond! Christmas arrived early this year - I salute our generous benefactors! 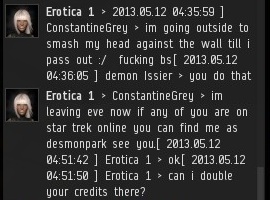 Erotica is a genuine businesswoman though, not a scamming isk doubler. The game she is describing involves players communicating with each other and mutual trust to win a big payout for everybody. I've personally observed the game and see big (and I mean BIG) payouts. What she does is really just a form of gambling, and as we know, the house has to win some times. Can I haz some stuff? I support this request for all cases where "I" = "Lenda Shinhwa". so, when can we expect some of those battleship hulls turning up in sanctioned destrction of miners. That will be one to tell the kids about. A computer game is his entire life; he takes a bet with his entire assets; he then blames someone else for it. I would like to see a suicide gank in a carrier please. Clearly this Thanatos has a glorious suicide ganking career to look forward to. I realize I made an error. Lady Quickdraw played a few days ago in a game to exactly 10b. 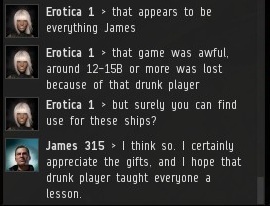 When that game failed (and she announced she was quitting Eve) I did a special event to continue on to 20b to save her. Sadly we also exceeded the 20b target and I had to keep it all. 2 or 3 players announced they were wiped out and some were quitting. The other guy who said he was going to bonk his head and go play Star Trek was just last night I do believe in another game to 10b. At the urging of other clients I allowed the game to be 100 million over or under. Sadly it was this event the drunk person ruined it. Contracts were coming furiously in along with his 2b and we ended probably above 15b including the ships. Since the game was clearly lost, I stopped counting at 12b. Another 2-3 players announced they were wiped out sadly. Guys, these events are easy if you just work together! Believe me, I am just as heart broken as those who lost because when people win these events it's like I'm the person handing out the checks for Publishers Clearinghouse. That's why I like to have people on TS for these as well. You're a genuinely generous person Erotica 1, that's why I've always liked you, ever since that first time you doubled my ISK. This pleases me. Just goes to show that the strength of the New Order is not within a single man, but within a thought. An immortal, immaterial thought that cannot be destroyed by bad intentions. The New Orders hope of saving High Sec is a thought unmovable, James 315 a force unstoppable. Please can we blow up all those mining ships? Or maybe give them to some worthy code compliant miners? When greed > sense always the downfall. Their own greed is what makes them fall victim to Erotica 1's schemes. 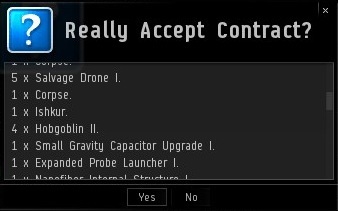 Perhaps learning such lessons in EVE will make them more resilient to real life; less likely to invest with the likes of Madoff. Maybe you haven't heard Anon, but we here in the New Order support all emergent gameplay no matter what form it takes. 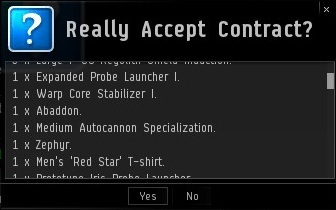 Erotica is a shining example of how your SP count makes no difference to your success in Eve. She does nothing a 1 day noob couldn't do. 290x: I beg to differ, a day 1 noob could not double isk of anyone since a day 1 noob has no money. 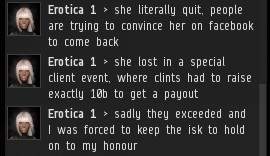 Unless you are saying that she does not double isk and is just a scammer. "290x: I beg to differ, a day 1 noob could not double isk of anyone since a day 1 noob has no money." When I was a day 1 noob, I had some money. Therefore, you are incorrect. That is a nice thought, but completely unnecessary. These items were intended as a gift. If I wanted something in exchange, I would have asked. The comfort I get from knowing that these ships and items will be used for an important purpose is all that I require. When I want more shares, I will buy more shares- just as all shareholders do. I do not need any special treatment. In fact, I call upon everyone to give just a little bit more to the New Order. Don't worry, I will be increasing my stake as well as time passes. I am getting goosebumps just thinking of the NO birthday coming up.